This is great as it acts like thread, not like a wire! Spun from stainless steel fibers and nylon this conductive thread is the perfect solution to all your e-textile needs. 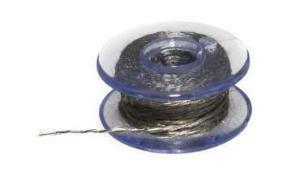 Our pre-wound plastic bobbins each come with 16.4 feet (5 meters) of conductive thread. Most projects only need 1 to 3 feet of thread, such as our bracelet example, which uses 3 feet of thread each.